Hi, I want to lubricate these laptop hinges but I am not sure what to buy or if it is possible. Over the past 4 or 5 years I have lost 2 nice laptops because the hinges broke the frame due to the hinges being hard to open / shut. Here is the laptop I am trying to save. The hinges are getting a bit tough but nothing is broken. (no it's nothing special but I like it). 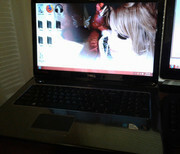 It is a Dell Inspiron n7010. So far I have already done the following things: I took off the plastic piece that surrounds the screen. This lets you look inside the black plastic cylinder that holds the hinge. I read that dirt and little things can get in the hinge and cause problems with it so I used an air compressor to shoot strong air into the black cylinder all around the hinge. I let it sit and worked the lid back and forth while the silicon lubricant soaked in. The lid did become some easier to open and shut but not enough to meet my preferences. I am not really that picky, I am just trying to make the hinges not break the frame of the computer. I woke up this morning and would not feel comfortable shutting the lid regularly since it seems the Du Pont is not good for this job. The hinge had become not easy to open / shut again so the Du Pont did not seem to last. I tried chatting with some Dell customer server people last night to find out if I could buy the lubricant they use on their laptops... or if they would at least tell me what it is made of. I didn't think they would help me but I still tried. All they would do is ask me if I wanted to buy replacement parts probably for 20 to 40 dollars. This is where I am at. If anyone has had success with laptop hinges or has useful advice please help. Thank you. Edited by Jenna91, 13 April 2019 - 09:31 AM. Careful, there must be some resistance. If you over-lubricate, the laptop screen will simply flop closed or all the way back. The plastic piece that surrounds the screen is there to keep out dust, hair etc so needs to be replaced. Something like WD40 with the nozzle tube would be good for getting into the hinges, don`t overdo it as any more than a quick blast will just liquefy and drip onto whatever the notebook is resting on, as long as there are no creaks when the notebook lid is opened or closed you should be fine as long as care is taken. Thank you for the replies. I have gotten the feeling through searching for about a week that basically I am an oddity and hardly anyone messes with these hinges. To help others know what they are dealing with, let me show you what I have. When you open a laptop lid, the first thing you want to do is listen for a bunch of plastic pieces making a little squeak sound. If you hear a lot of creaking that should be a caution mark for purchasing. We tend to think when we open a lid that it is a moving part so little squeaks will come naturally with movement. As a side note, I am very gentle and clean with laptops. I open the lid with two hands from a position that does not stress the laptop. Nevertheless, after having TWO very nice laptops both have their frames break around the lid over the last few years ( 1 toshiba, 1 dell) I have become very suspicious of this part on the laptop. Now take a look at this laptop. This is the one I want to keep. There is a little squeaky and tiny bend. Most people would pay no attention. The common reaction is to say, "there needs to be resistance so the lid doesn't just fall". This is definitely true, but you need to able to move the hinge without causes stress to the plastic frame of the laptop, otherwise it will just break (speaking from experience). You will notice there is a tiny bend around the frame still, which doesn't seem like much but these are very tiny plastic parts that work together. Over 2 or 3 years, this would break. The only thing I can think of now is that when they torque these hinges at the factory people like a sturdy feeling lid because this implies the laptop itself is sturdy. However, over the 3 or 4 years the torque is too tight and that's when you either have to figure out how to fix it (like I was looking at here) or buy a replacement hinge and lid set for your model laptop. Thanks for reading, I hope this info helps someone. If you have any further tips for me let me know. I'll watch this thread for a few more days. My reasoning for being so weird is I will travel a lot in the future because I play bass and I need something I can open for an hour then shut and put back in my bag. This is the lifestyle that comes with that line of work. Basically I need a laptop I can open and shut 5 or 6 times a day and it's no problem at all. I think I will have do be particular about which laptop I buy that is sturdy enough to do this. Many are not. Edited by Jenna91, 14 April 2019 - 10:19 AM. The WD-40 I tried just for laughs and it did seem to help a little bit. edit: see my post further down for how the WD40 went for anyone trying this. Edited by Jenna91, 18 April 2019 - 05:06 PM. If you need a durable laptop, get a ThinkPad. It may not be pretty but, it take a licking and keeps on a ticking. I have never heard of the problem you are having. I would caution on using a liquid lubricant because the dust would have a tendancy to stick to the lubricant and then make it a "sludge" in a matter of speaking. I would have tried a dry lubricant. I have had other people tell me to get a thinkpad if I am looking for durability so I think you're right. I kind of thought WD40 would be bad because I had read it is a de-greaser, but I tried it anyway. I had read about it before I started this thread. Initially it cleaned the test hinge so that the test hinge opened smoother, but maybe an hour later you get the squeak sound when you open the lid. This means metal on metal contact and is bad. I agree with 123runner in that the runny (Du Pont) stuff was just a mess trying to get it to stick in my hinges. It is a liquid. If anyone ever tries to purchase a product for your hinges on your PC I would look for something dryer. Concise: Don't use WD40. Try to find something dryer or thicker than a liquid. Probably a silicon based lubricant. This thread can be locked closed. Thank you for talking with me and giving me your input. You guys are always great on this forum. Edited by Jenna91, 18 April 2019 - 05:05 PM. The WD40 may not have done the job but the information in your attachment is factually inaccurate I`m afraid as standard WD40 is a petroleum based lubricant that once it evaporates leaves a dry slippery surface onto that which it has been applied, WD40 degreaser is a totally different product and one that quite obviously would not have been suggested for trying to free up the hinges on your notebook. Myth: WD-40® Multi-Use Product is not really a lubricant. Fact: While the “W-D” inWD-40® stands for Water Displacement, WD-40® Multi-Use Product is a unique, special blend of lubricants. The product's formulation also contains anti-corrosion agents and ingredients for penetration, water displacement and soil removal. Have tried this myself before. But you only need a small drop or wipe hinge with a piece tissue and it loosens up the hinge a bit and removes any squeaking noises. How uncanny, like 123Runner I`d never heard of this problem before this week.